Over the past several years, John Lewis advertisements have become an emotional holiday staple, so much so that even though we don’t have the stores in the U.S. we here are CinemaBlend still look forward to the ads. The latest holiday advertisement is a doozy, featuring an enterprising young girl, a lovely telescope and a man on the moon. Go ahead, try and make it through this advertisement without shedding a tear. The ad begins with a little girl who is sitting, bored, while her brother plays video games. She notices her family’s telescope (product placement!) sitting near a window, facing the moon. She takes a look and what she sees is a grizzled old man, living on the moon in a small little cable, alone. It’s nearing the holidays and it’s clear he’s lonely. But the little girl has a plan. 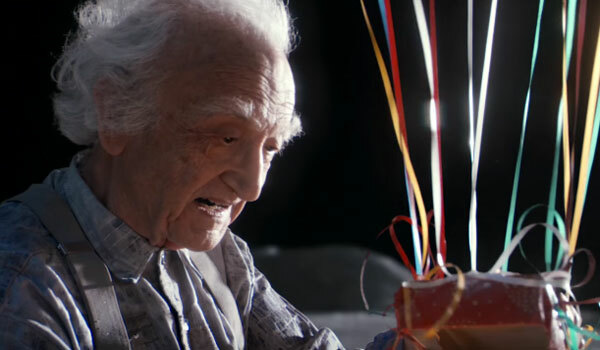 After several failed attempts, she manages to get a set of balloons to deliver a gift to the old man on the moon, to help him reconnect with the world he left behind. It sounds more fanciful than poignant, but throw in a cover of the Oasis song “Half the World Away” by Aurora and the emotional impact is totally heightened. Seriously, John Lewis is the Pixar of holiday commercials. Last year, they brought us that adorable and heartwarming penguin commercial that also made its way across the pond, despite the fact there are no physical stores here. This year, I sat in the middle of an office and bawled my eyes out unabashedly the first time I watched this thing. You need go no further than the look on the man’s face as his gift is delivered to understand the emotional ramifications of what you are about to get into. People spend more money on their loved ones during the holidays. Department stores and other chains make a huge chunk of their yearly sales during this time of year, which means advertising departments often up their games when it comes to commercials around the holidays. Some of these are funny, some of these are wacky, some of these are emotional, and some are them feature jingles that get stuck in your head for days on end. However, it’s often the ones that are emotional that are the most memorable, and the John Lewis ad is one we wouldn’t mind having on our TVs again and again. We’ll be bringing you the best of the best ads over the next couple of months, so stay tuned. Oh and happy holidays, even if it is a bit premature at this point.